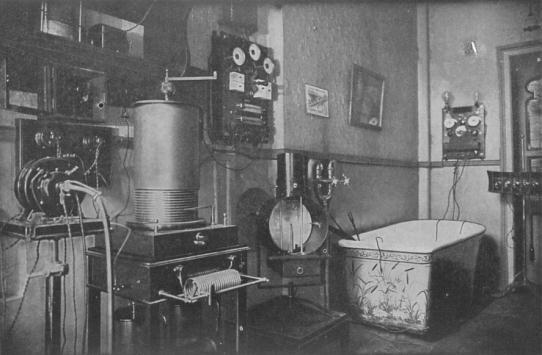 This photograph, probably taken some time in the 1920s, shows—not a Victorian or Edwardian torture chamber—but some of the strange apparatus used in providing different types of electrical or galvanic treatments. Such treatments were not part of the Turkish bath process. They were, and often still are, considered a form of quackery by many in the medical profession. Nevertheless, some establishments—including Batholomew's Turkish Baths in Bristol—did offer them as an extra. 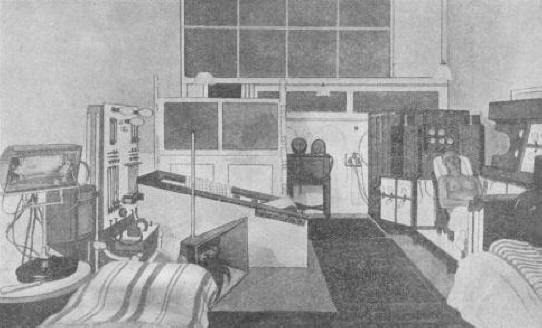 Why go away for a cure?, a contemporary brochure describing James's Hydro, states that there was also a separate treatment room catering for women patrons. But it is not absolutely certain whether the women's room actually existed, at least when the booklet was published; for while the image of the gents' room is a photograph, that of the women's room is an artist's impression.